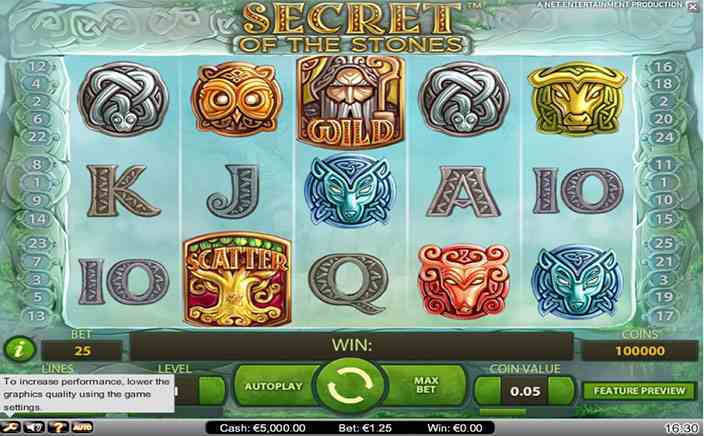 Secret Of The Stones is a slot game developed by NetEnt. Ancient druids form the theme of this slot. The druids were very prominent in Northern Europe before the rise of the Roman empire. This slot promises to be exciting with cool bonus features. Read on to learn more. In this slot, you can see a stone arch enveloping the reels. This arch has Celtic inscriptions and drawings carved on it. The theme music can be creepy. However, this adds to the excitement. Sound interesting already? Well, here is more! You have 25 fixed paylines and 5 reels. NetEnt maintains the standard playing card icons of A, J, K, Q, 9 and 10 as the low-value symbols. The symbols with high-values are depicted as animals. These symbols are a deer, an owl, a snake, a bull, and a wolf. 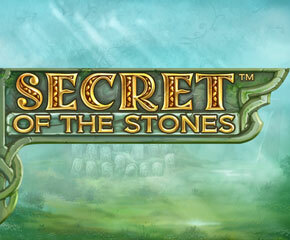 Secret Of The Stones slots has a Wild symbol that is represented by a Druid. The wild will substitute other symbols on the five reels. When this happens, players will have a better chance of attaining winning combinations. A Tree represents the Scatter symbol in this slot. This is the only icon that the wild cannot substitute on the reel. The scatter will activate the base game’s bonus feature. The wild can also be an Expanding Wild in the bonus round. It will spread out and fill up a reel to further boost winning combinations. Players can play a Free spins bonus round in this slot. This is triggered when they are able to land at least three Tree Scatter symbols. However, there is a slight difference in this round from other free spins. Players are initially given 10 free spins. They are then taken to where they can select any one of the many presented carved vertical stones. They can gain additional free spins, multipliers and even an expanding wild bonus through these stones. The Expanding Wild bonus occurs only on reels 2 and 4. Secret Of The Stones slots has a creative bonus feature. The sound is spooky but cleverly done. It gives the game a mysterious feel. The graphics are also well done and neat. With the free spins, extra spins, expanding wilds and multipliers. Players can boost their wins and eventually their payouts.